One of the traits of successful business people is their ability to communicate. Successful businesses center around great ideas, augmented by the ability of their leaders to clearly and persuasively convey why their product or service is important for their target audiences. These leaders have the gift of simply and effectively underscoring the need for what they do and how their product or service benefits their customers. But in many instances, there is a single trait that distinguishes a business leader from their competitors. It costs nothing but a modicum of patience and minimal amount of time. That “magic bullet” is listening. Canadian business consultant Brady Wilson—whose Juice, Inc. has earned a reputation for improving communications between businesses, their customers and their own employees—offers an insightful tip on getting people to engage. Wilson shares a story about a bank that decided to change its customer service interactions. Like every other financial institution, the bank was engaged in transactional currencies where one transaction was just like another. However, by engaging the brain and the heart in tandem in a process called “human currencies,” the bank was able to increase the sale of financial products and increase customer loyalty. The first step was to ask a question: “How are you doing?” By demonstrating empathy along with patience, bank employees were able to make a positive brain connection with the customer. By recognizing the “human element” through active listening, positive changes in customer service interactions happened. Active listening requires a conscious effort to hear not only the words that another person is saying, but more importantly, the complete message being communicated. This demands that one pays attention to the other person. You cannot allow yourself to become distracted by whatever else may be going on around you or by forming counter arguments while the other person is still speaking—nor can you allow yourself to get bored and lose focus on what the other person is saying. 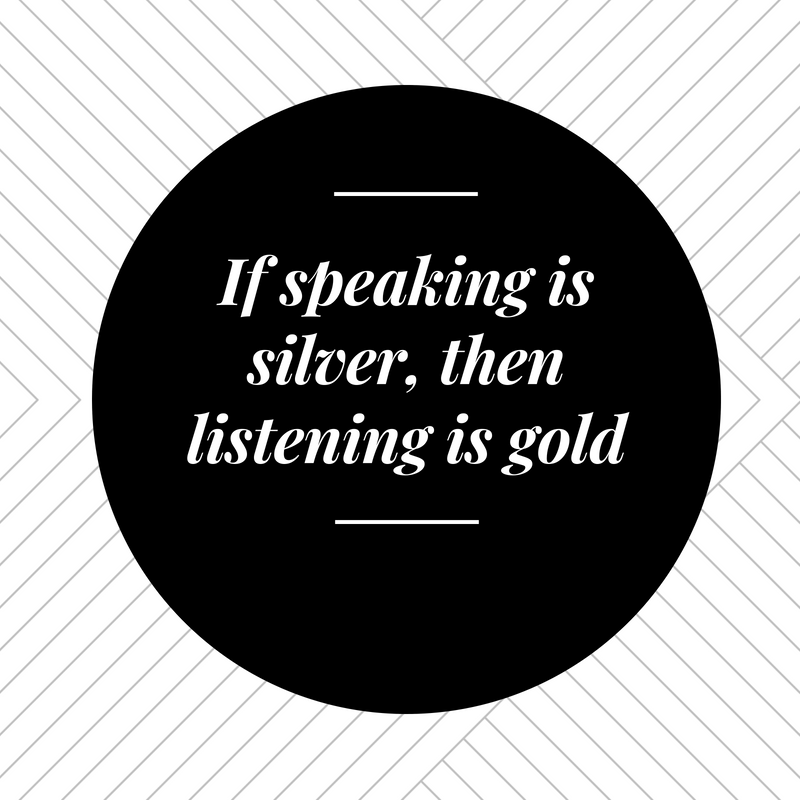 In short, active listening is hard work. It requires patience and focus. It demands putting aside what you want to say and deferring to someone else for a few moments. And it demands a commitment to listen. More examples and insights about aggressive listening are underlined by an insightful article by publisher Ashley Stahl, a Forbes contributor, who makes her point by showcasing three Ted Talks in an April 30, 2018 article. You can hear the Ted Talks here. Try talking with Wellons Communications. We listen. At Wellons Communications, we take listening very seriously. We know what we know…but there is a lot we don’t know. The only way we find out what we don’t know (and need to know) is listening. We listen to what our clients want to accomplish. We pay attention to what our clients’ target audiences say they want, another form of listening that can point us in the right direction. Only by listening to our clients can we accurately and successfully help them communicate – and listen – to their target audiences. Take a shot at active listening and give us a call. Start by telling us what you want to do and, generally, how you want to go about it. We’ll listen. We will ask questions. And then we will listen some more. And, when it comes time for us to provide feedback, we will have a clear idea of what you want to accomplish and have sound ideas of how we can help you achieve your goals. I’m ready to start listening to what you have to say. Call me at 407-339-08798 or email me at will@wellonscommunications.com.